I had heard talk of this book but still hadn’t read it when in the course of a typical IEP meeting, the mother of a 17-year-old student broke down in tears, explaining that she still hadn’t come to terms with her child’s learning disability. I always knew it was hard for families to come to grips with these realities as their children made their way through elementary school, but this was the first time I was witnessing the pain of this situation as it plays out at the high school level, and it affected me deeply. 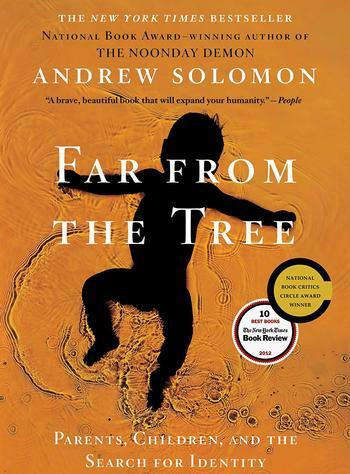 Soon after, I ordered Far From the Tree, by Andrew Solomon, so I could have a better understanding of what some families are going through. This powerful 960-page tome is about children who “fall far from the tree,” or develop in a way that is markedly different from their parents. Author Andrew Solomon taps into the lives of families learning to accommodate children with specific special needs or facing unique circumstances, from those struggling with physical and developmental disabilities to those seen as prodigies. In this framework, Solomon identifies one differing identity or circumstance per chapter and weaves together insightful prose with firsthand accounts of those he has interviewed over the years. While reading chapter after chapter, one truly gets a sense of how many years the author has invested in this project. These sections devoted to different issues don’t claim to touch the surface of the topic in question; rather, they are more like the pillars of a house that is built on the shore. In a book this size, there are naturally several takeaways to be had. Key among them is the chance to gain a deeper understanding of the unique identities that have emerged within the context of these families. “Fixing is the illness model,” writes Solomon persuasively. “Acceptance is the identity model.” While individuals may struggle for some time to understand themselves and their place within their families, the stories in this book describe the various ways that many are able to find an identity in what started off as a difficulty. Far From the Tree also offers some eye-opening information and a spate of new ideas to consider. The reader learns about the astonishing rates of autism across the U.S., shocking anecdotes from 70 years ago, and common (but rarely discussed) medical ailments among people with Down syndrome and dwarfism. Did you know that, without the benefit of early interventions, hearing-impaired persons are likely to have a lower intelligence than those who receive support? Yet the biggest takeaway leads back to the reason I picked up this book in the first place. Solomon addresses a perennial dilemma some parents face when he says, “Parents of children (with autism) such as Cece fear that their love is useless to their children, and they fear that their deficits of love are devastating to their children, and it’s hard for them to say which fear is worst.” This is something I haven’t considered, though I have worked with many children with autism along with their families. I first picked up this book in order to understand what happens behind the scenes. Solomon’s insightful analyses bring up issues that really have no clear answer, but raise important questions and prompt discussion. These are considerations that also apply to the other side of the spectrum, so to speak, with gifted children. In the chapter entitled Prodigies, Solomon starts one section with this difficult thought: “Pushing talented children can backfire; not pushing them can backfire, too.” Having the opportunity to dissect these thoughts makes the reader understand the difficulties that parents with all types of children can face. Far From the Tree is a page turner. You may tell yourself you’re only going to read one short section but soon find yourself finishing the chapter. The stories and insights are compelling, and the internal shifts prompted by reading this book make it a must-read, not just for every special educator but for all people that work with children and families.